Yesterday, August 18, marked one year and 100 days since I began posting a photo a day on ‘The State of London’, a Facebook page I established on May 11 last year, marking five years since I first began cycling around London on my bike, taking photos of whatever interested me. You can see all the photos to date here. In the six years and three months since I began this photo-journalistic project, I have been out on my bike almost every day, cycling many thousands of miles across all of London’s 120 postcodes, and discovering that what interests me are the changing seasons, the changing weather, the River Thames and the capital’s other rivers, its canals, its parks, and my own idiosyncratic take on the built environment, in which I’m drawn to the old, the odd, the idiosyncratic, the run-down, the derelict and the abandoned, and also to social housing — the great post-war estates, currently facing an unprecedented threat from councils across the political spectrum, who, financially squeezed by central government, are entering into deals with property developers to demolish their estates and to build over-priced new developments from which almost all the existing tenants are priced out, an epidemic of social cleansing that is largely unnoticed by those who are not directly affected by it. Next March it will be eight years since I gave my life over to chronicling Guantánamo and the 779 men (and boys) held there, and campaigning to get the prison closed. I did this initially through my book The Guantánamo Files, and, for the last six and a half years, I have continued to seek the prison’s closure — and to educate people about the men held there and the lies told in the “war on terror” — as a full-time independent investigative journalist. Nearly four years ago, I began to put together chronological lists of all my articles, in the hope that doing so would make it as easy as possible for readers and researchers to navigate my work — the 2100 articles and pages I have published since May 2007. Unfortunately, I have found it difficult to keep up to date with this project for the last two years, hence this belated entry covering all the articles I wrote from July to December 2012. Poplar Dock, Canary Wharf and Greenwich on the Eve of the Olympics, a set on Flickr. This photo set is the 82nd in my ongoing project to photograph the whole of London by bike, which I began last May, and is the last of five sets taken on July 25 last year, a wonderful sunny day two days before the Olympic Games began, when I cycled east from Whitechapel along the A11 — Mile End Road, which becomes Bow Road and crosses the A12 on the way to the Olympic Park along Stratford High Street. I then cycled around the perimeter of the Olympic Park, up to Leyton on the eastern side, then along the A12 at the north, and then back south via Hackney Wick and Old Ford on the east, then through Bow, Bromley-by-Bow, Poplar and the Isle of Dogs, stopping in on Greenwich before returning home to Brockley. East End Odyssey: A Journey from Leyton to Poplar, a set on Flickr. This photo set is the 81st in my ongoing project to photograph the whole of London by bike, which I began last May, and is the third of four sets which either precede or follow on from a set I published last July, entitled, “The Olympics Minus One Day: Photos from the Frontline in Stratford” (and see here too), in which I cycled east from Whitechapel along the A11 — Mile End Road, which becomes Bow Road and crosses the A12 on the way to the Olympic Park along Stratford High Street. 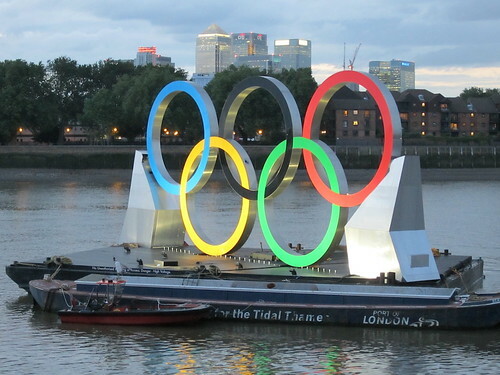 In the Olympics set I published in July, I then cycled up to Leyton, along the A12 at the north of the Olympic Park, and then back south via Hackney Wick, Old Ford, Poplar and the Isle of Dogs, stopping in on Greenwich before returning home to Brockley. From Mile End to Bow and Stratford on a Summer’s Day, a set on Flickr. This photo set, the 80th in my ongoing project to photograph the whole of London by bike, which I began last May, is the second of three that precedes and follows on from a set I published last July, entitled, “The Olympics Minus One Day: Photos from the Frontline in Stratford” (and see here too), in which I cycled east from Whitechapel along the A11 — Mile End Road, which becomes Bow Road and crosses the A12 on the way to the Olympic Park along Stratford High Street. 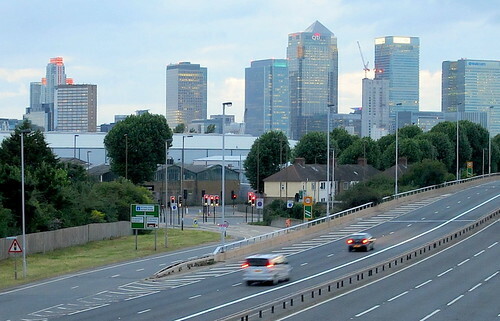 In the Olympics set I published in July, I then cycled up to Leyton, along the A12 at the north of the Olympic Park, and then back south via Hackney Wick, Old Ford, Poplar and the Isle of Dogs, stopping in on Greenwich before returning home to Brockley. Consumer Overkill: Piccadilly Circus and Leicester Square, a set on Flickr. On September 10, 2012, the BBC World Service gave me an excuse to photograph the West End of London, in all its garish consumer glory, after I had taken part in a news programme, discussing the potential handover of the US prison at Bagram airbase in Afghanistan to Afghan control — a topic I know something about as a result of the research and writing I have undertaken for the last seven years as a world expert on the “war on terror” prison at Guantánamo Bay, Cuba. Shops, Ships and Union Jacks: A Surreal Tour Around Canary Wharf, a set on Flickr. This photo set — the 60th in my ongoing project to photograph the whole of London by bike — is the last in a series of five sets recording a journey I made one sunny day in July, from my home in south London, through New Cross and Bermondsey by bike, across Tower Bridge, and up through Shadwell to Commercial Road, which I followed — with many fruitful deviations — along its whole length, to the junction where West India Road bears off towards Canary Wharf, and Commercial Road becomes East India Road. Please, please, please sign and promote the petition, initiated by Pat Onions and other disabled activists, calling for the British government to “stop and review the cuts to benefits and services which are falling disproportionately on disabled people, their carers and families.” The petition needs to reach 100,000 signatures by November 1 to be eligible for Parliamentary debate. One month ago, the Paralympic Games came to an end, and there were hopes that, after two weeks in which disabled people had been the focus of the media and the British people, and had performed spectacularly well, the time might be ripe for those fortunate enough not to be physically or mentally disabled to realise that they were being lied to by their government, and that the Tories’ wretched assault on disabled people as cheats and scroungers was both cruel and deeply unfair. In a cynical attempt to cut expenditure on welfare, the government has embarked upon a particularly horrific assault on the mentally and/or physically disabled through the Work Capability Assessment (WCA), administered by the French-based multinational company Atos Healthcare, and designed to find disabled people fit for work, even when, as in a heartbreakingly large number of cases, they are not. 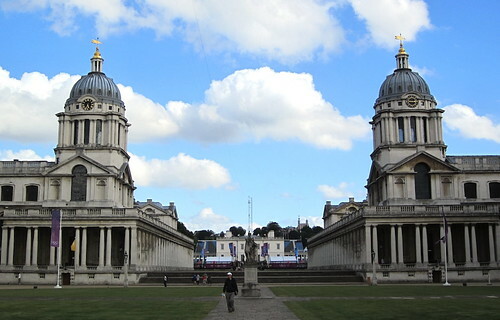 Blackheath and Greenwich: Olympic Memories and Other Journeys, a set on Flickr. In my ongoing project to photograph the whole of London by bike, which I began in May, the extent of my cycling, and of my photography, has far exceeded my ability to upload the photos to my Flickr account. I have over 160 photos sets to upload, of photos taken before my family holiday in August, and in the six weeks since my return — photos from the West End, the City, from east London, north London, west London and south London.